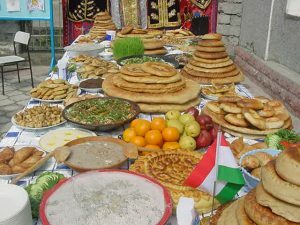 Gahambars are six seasonal festivals or high feasts when Zoroastrians assemble to eat and share food communally. They are joyous occasions at which rich and poor met together, new friendships are formed and old disputes resolved. While each gahambar traditionally spans five days, nowadays it is the last day that is usually observed. The Gahambars are the only festivals mentioned in the Zoroastrian scriptures, the Avesta. Some authors such as Mary Boyce feel it is reasonable to conclude that the Gahambars were instituted by Zarathushtra himself. Gahambars are a demonstration of beliefs, principles and values in action and are an expression of piety in thought, word and deed. Next to Nowruz, gahambars are festivals of special significance for Zoroastrians. The food stuffs are contributed anonymously according to a person or family’s means. Many community members volunteer to prepare the food, prepare for the occasion and serve the meals – without regard to status. During the meal, everyone sits together and partakes of the same food. The customs are an expression of egalitarian communal togetherness. The free and equal sharing of food with everyone, the environment of togetherness, goodwill and sharing – all serve to help build and strengthen the community. While the Zoroastrian scriptures, the Avesta does not use the word “gahambar or gahanbar”, the books of Yasna at 1.9 and Visperad at 1.2 mention the names of the six different gahambars/gahanbars in connection with the “yairya” [said to stem from the Avestan “yare” meaning a (solar) year and which might mean annual (feasts)] and with the saredhaeibyo, the solar year or seasons. We find the word “gasanbar” in Pahlavi, Middle Persian texts. The Lesser and Greater Bundahishns at 25.1 mention the division of the year into the period of the six gahambars and calls them “gas”, divisions (some translate as “seasons”), of the religious calendar. Remembrance of the souls of the righteous and one’s ancestors. The number seven plays a significant role in all Zoroastrian and Zoroastrian-based customs and rituals. Seven stands for the divine seven, God and God’s six archangels. There are also seven aspects to the corporeal creation (gaiety): fire, air, water, earth, plants, animals and human beings.